Non-rechargeable 9 volts alkaline batteries usually cannot be recharged. But actually it can be recharged, though not as good as new or not as good as a rechargeable battery. This procedure is very helpful if you have no time to replace the battery with a new one. Good quality 9 volt batteries can usually be recharged many times. The following video shows the process of charging a non-rechargeable alkaline 9 volts battery. 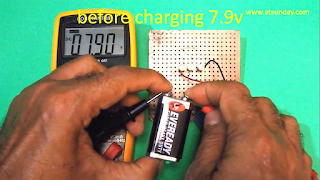 Before being charged, make sure the battery voltage is not less than 7.2 volts. The battery condition is still good, does not leak, does not rust. Charging is carried out with a voltage of 12 volts. 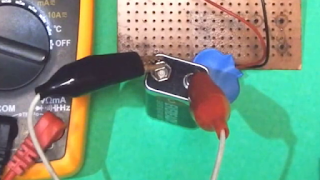 In video, the charging power comes from the 12v adapter. In the photo above, the battery voltage is still about 7.9 volts, and the battery condition is still good. Connect the positive wire of adapter to the positive pole of battery, and the negative wire of adapter to the negative pole of battery. Let it connects for around 30 seconds. It needs only a small charging current about 10 mA for this 9v battery. As the photo above, the black clip is negative and it is connected to the battery negative pole. The red clip is positive and it is connected to positive pole of battery. Do not recharge too long, because the battery can get hot. Let it cools for a few moments. If the voltage is still low, then recharge it again. After recharging the battery voltage reaches 9 volts. One LED voltage is of around 3 volts. Because there are 3 lights arranged in series, then the LED voltage is 9 volts. The light becomes brighter, after the battery is recharged.